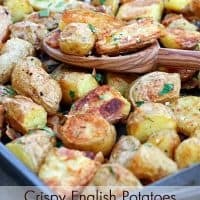 I make a lot of roasted potato side dishes, like these Parmesan Garlic Roasted Potatoes, because I know my family will devour them and I won’t have any leftovers. But of all the roasted potato recipes I’ve tried, these Crispy Potatoes with Pancetta are my absolute favorite! I’m sure the pancetta has something to do with it, but these potatoes are just amazing. Hard to believe with such a short, simple ingredient list. The potatoes are boiled for a few minutes to start, then drained and shaken in the pot. This extra step is the key! Shaking the potatoes roughs up the edges of the potaotes just enough that they get extra brown and crispy in the oven. Trust me, don’t skip the boiling or shaking. It’s what makes these potatoes extra special. Cover the potatoes with water by 1 inch and add 1 tablespoon of salt. Bring potatoes to a boil. Simmer for 8-10 minutes, or until potatoes are just becoming tender on the outside. Drain the water, leaving the potatoes in the pot. Meanwhile, as the potatoes are boiling, place the pancetta on a lightly greased sheet pan and roast in the preheated oven for 5 minutes. Put the lid on the potatoes and, using a kitchen towel, grasp the pot with the lid on and shake the potatoes vigorously for a about 10 seconds to rough up the edges. Add the olive oil, 1 teaspoon salt and 1/2 teaspoon pepper to the pot and shake a few more times to mix well. Pour the potatoes onto the baking sheet with the pancetta and toss to mix, spreading everything in an even layer. Roast the potatoes and pancetta for 45 minutes, stirring occasionally, until they are very browned and crisp. Sprinkle with parsley and additional salt and pepper, to taste, before serving. Looks great! I actually have some yukon gold potatoes on the counter. I will give these a try this week. We love potato anything. These will go down really well. 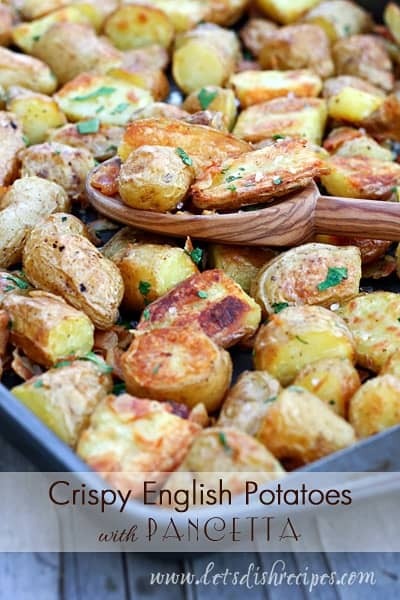 Love crispy potatoes the best. Made these in place of our typical fried potatoes for breakfast. Big hit! Plus it freed up a spot on our stove. Even better!